What's Going on Today: After all the packing... we are finally unpacking. 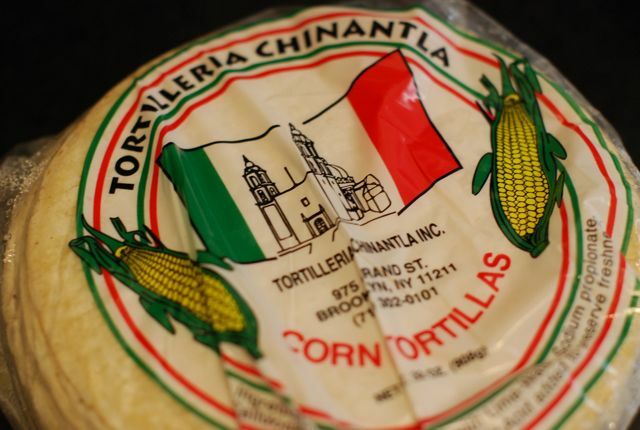 Tonight's Menu: Take-out from the mexican place up the street we can't wait to try. Parenting Lesson of the Day: Sometime change is good, even for kids. So, we've moved. It was a stressful, chaotic event, just like all moves are, but we've done it. Needless to say we are beyond thrilled that everything worked out and are very grateful to our pals at Moishe's for taking good care of us. 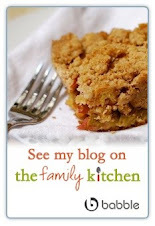 Since I am busy unpacking boxes today I am posting a Webisode I shot last week for my favorite seasonal Big Crumb Rhubarb Coffee Cake. As you know, I freeze rhubarb at the end of each summer so that I can enjoy it year round. Last week I was busy cleaning out the freezer and making sure no good food went to waste. This meant thawing and using up my last bag of rhubarb from summer 2009. This was actually good timing since we have just begun rhubarb season in the Northeast. My mother has reported that the plants in Cooperstown have started budding. We should have our first stalks in a couple of weeks. As you'll see, I made this delicious cake while my daughter napped in the afternoon then we ate it the next morning for breakfast. It lasted us for a few days which was perfect since I let everything else in our pantry run out, including our usual selection of cereal and oatmeal. It's longevity on the counter also makes it great for entertaining. It can easily be made 1-2 days ahead of time for a brunch or breakfast. I've baked a lot of coffee cakes in my life and this one, I think, is the absolute best. 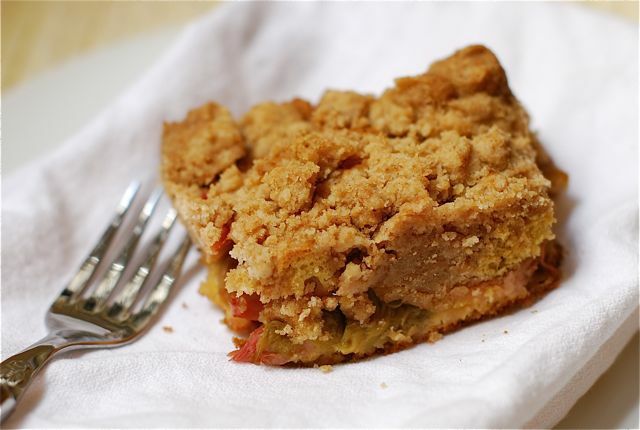 The cake is moist and creamy but doesn't overshadow the sweet flavor of the rhubarb. I also love the large sugar crumbs on top, they add just the right amount of crunch on top of the vegetable layer. I hope you all get a chance to make it this season and love it as much as we do. I'll be back next week with reports from the new kitchen. And, yes, my daughter loves her new - much larger - bedroom and is taking nice, long afternoon naps as always. 1. Preheat oven to 325ºF. Butter and flour an 8" square baking pan. 2. In a large bowl, toss the rhubarb with sugar, cornstarch and ginger. Set aside. 3. Make the crumbs by placing sugar, spices, salt, butter and flour in a bowl. Using clean hands, pinch the ingredients together until they form a solid dough but is still a bit crumbly. Set aside. 4. To make the cake, in a mixer fitted with a paddle attachment mix the sour cream, egg, egg yolk, vanilla and butter. Then, in a separate bowl whisk together the flour, sugar, baking soda, baking powder and salt. With the mixer on low, add the flour mixture bit by bit until it is totally incorporated, but not overbeaten. The mixture should be totally smooth and slightly sticky. 5. Pour 3/4 of the batter into the greased 8" baking pan and pat it down evenly. Distribute the rhubarb over the top in one single layer. Dollop the remaining cake batter over the rhubarb in a few spoonfuls and make sure it is somewhat even. 6. Using clean hands, crumble the large crumb dough over the top of the dough. The chunks should be anywhere from 1/2" to 3/4" in size. The whole cake should be completely covered. Bake for 45-50 minutes or until a cake tester inserted in the center comes out clean. Cool and serve. Naptime Recipe Variations and Ideas: I've never tried this with any other berry but I bet it would be great with blueberries or blackberries. This cake is fantastic for entertaining and would be perfect to serve on a buffet table for brunch. Naptime Stopwatch: Making this cake takes about 45 minutes, plus baking time. Naptime Reviews: My daughter is slowly becoming a rhubarb fan and loves this cake as much as we do. What's Going on Today: Boxes, packing, general mayhem. Picked up new shower curtain for upstairs bathroom in new place. Naptime Goals: Finish packing clothes, confirm movers. 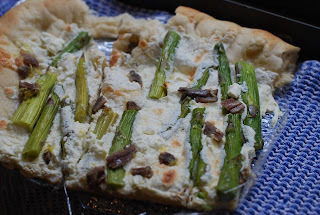 Tonight's Menu: Springtime Asparagus Pizza from Food52. Wine. Lots of wine. Parenting Lesson of the Day: Kids are more resilient then we give them credit for. Despite the growing pile of boxes my daughter seems remarkably accepting of our home being packed up bit by bit. She awoke after her nap today to find the contents of my closet in suitcases. This wouldn't normally alarm a child except that mine loves to dive into my shoe rack and clatter around the house in high heels any chance she gets. (I am not-so-secretly proud that she is already this obsessed with shoes.) She peered into the suitcase and pointed at the shoes while I explained that they are making a trip to the new house on a big truck. She asked if she could go on the truck, too, not wanting to miss out on any potentially exciting event. Gotta love her adventurous spirit. In a few short hours we will be residents of CT and, truth be told, though I am sad to close the NYC chapter of my life, I am excited to return to my country roots. I am, at heart, a country girl and love the slightly slower pace that comes with life outside of the city. The best thing about this move really is that I'll be a mere 30 minutes from the heart of the Big Apple, so I am really not giving up much at all. I also look forward to country cooking. Of course I'll be cooking the same food I do in New York, except my new farmer's market will be thrice as big as anything in the city, plus I'll have a deck for herb pots and tomato plants. I can finally grow my own food, just like my parents did for us growing up! Don't worry, the minute all of this starts you'll be the first to know. In the mean time, with half the kitchen in boxes and no time to Naptime Chef today, I am making pizza. It just so happened that this recipe was up for grabs on Food52 for recipe testing and I jumped at the chance to try it out. I love pizza of almost any flavor and still have an unpacked jelly roll pan in which to bake it. This is what's known as food serendipity. I've made all sorts of pizzas in the oven but this is my new favorite. It was a snap to make at dinnertime since I started with fresh pizza dough from Whole Foods. I even put my daughter in charge of sprinkling on the cheese which she loved. The baking time for the pizza is brief and, I'll admit, I was nervous that the asparagus wouldn't tenderize enough in the oven, but it did. After 10 minutes of roasting it was tender to the bite, but not overly wilted. It's flavor was balanced beautifully by the salty mozzarella and tangy goat cheese and rounded out with a smattering of lemon and anchovies. We couldn't enough of the symphony of flavors that created a near perfect springtime pizza and devoured the whole thing. I know this pizza will work well with other spring and summer vegetables and I intend to try them in the future. In fact, given my increased storage capacity in the new place, I might be able to invest in a pizza stone or even attempt pizza on the new grill. The sky's the limit! In the mean time, I am looking forward to returning to my regular routine of cooking during naptime next week and can't wait to share it all with you. 1. Preheat oven to 500ºF for 1 hour. If using a pizza stone, pre-heat it in the oven as well. Or, if using a jelly roll pan, rub it with a thin sheen of olive oil and sprinkle it evenly with a tiny bit of cornstarch. 2. Place pizza dough on a lightly floured surface and press outward until it is about 14" in diameter. If using a 10x15 jelly roll pan, press the dough until it fits the pan completely. 3. Distribute mozzarella over the top of the pizza, leaving 1" on all sides for the crust. Then, add the asparagus in any desired pattern and clumps of goat cheese. 4. Bake for 8-10 minutes, or until crust browns and the cheese melts. Then, remove the pizza from the oven and scatter the lemon zest, chili flakes and chopped anchovies evenly on top. Slice and serve. Naptime Recipe Variations and Ideas: If you are not in the mood for asparagus other vegetables like peppers, artichoke hearts or eggplants would work well with this pizza. If you don't have goat cheese on hand, ricotta would be a nice substitute. Make this thin and serve it in small triangles for a nice appetizer! Naptime Stopwatch: Preparing the pizza takes 10 minutes and baking it takes another 10. A great meal to make days before a big move! 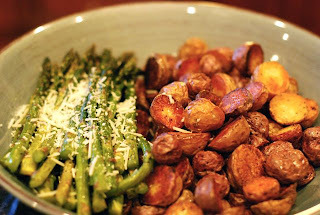 Naptime Reviews: My daughter is not the biggest fan of asparagus, but I am working on it. I think this pizza might help her come around. What's Going on Today: Finalizing things with the movers, taking advantage of last few days in New York! 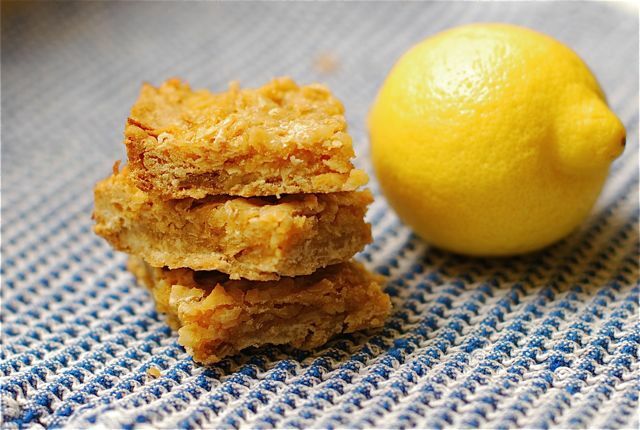 Naptime Goals: Make Lemon Coconut Squares for picnic in Central Park tomorrow. Parenting Lesson of the Day: Don't pack the toys 'til last. I am trying to take advantage of everything New York has to offer over the next few days and tomorrow we are doing a picnic with friends in the park. We are all bringing homemade food to enjoy - kind of like a Central Park Potluck. It will be a really fun celebration for all of us. Though the kids will be running riot the parents will feast and I am going to do my best to contribute by making my favorite spring treat for potlucks or bake sales, Lemon Coconut Squares. With leftovers in the fridge tonight this is a great day for baking. I am also baking these in honor of Big Girls, Small Kitchen and their Virtual Bake Sale. I love collaborating with Cara and Phoebe and when they wrote to ask for my participation in this event I jumped at the opportunity. Big Girls, Small Kitchen will partner with Baking For Good, an online mail order gifting service for sweet treats that donates 15% of every purchase to a cause of the customer’s choosing. Big Girls, Small Kitchen will develop a cookie to be sold on the Baking For Good site and the confection will be available exclusively from April 19th - May 9th (Mother's Day). BGSK will sponsor the Bake Sale event as a means of raising awareness for The Valerie Fund, an organization in the tri-state area that provides comprehensive health care for children with cancer and blood disorders. Baking for Good will offer an extra 5% donation to The Valerie Fund when people purchase the BGSK treat, even if another charity is selected as the primary recipient of the donation. I can think of no better way to celebrate spring then by supporting a charity that helps families with cancer. I also can think of no better treat to share with you right now then these squares, they simply scream spring in every way and would be a surefire hit at any bake sale this season. Unlike my other favorite lemon bars, these are more like coconut squares baked on top of a shortbread crust with a lemon glaze. The bright citrus and coconut flavors are light and refreshing with a great balance of tart and sweet. Furthermore, they are easy to bake during naptime, as you'll see. After they've baked I let them rest overnight (sneaking the occasional nibble here and there) and cut them the next morning for our picnic. Like a lot of desserts involving fruit I find that these squares are most delicious after they've been able to sit overnight. The flavor ripens and is more vibrant the next day. I hope you enjoy these as much as I do. To learn more about the Valerie Fund please visit this website and thanks again for your participation in this great cause. 1. Preheat oven to 275ºF. Butter and flour a 9x13 baking dish and set aside. 2. In a bowl mix the butter, flour and brown sugar. Using clean hands, pinch it together until a dough forms. Press the dough into the bottom of the 9x13 baking dish and bake for 12-15 minutes, or until the edges are lightly browned. 3. While the crust is baking, make the filling. In a large mixing bowl combine the lightly beaten eggs, brown sugar, coconut, flour, baking powder, salt and vanilla. Using a wooden spoon, combine all of the ingredients until everything is completely incorporated. 4. When crust has finished baking, remove it from the oven and all it to cool for 10 minutes. Increase the oven temperature to 350ºF. 5. Once the oven has hit 350º spread the mixture on top of the crust and spread it smooth with a wooden spoon. Bake it for 22-25 minutes, or until the coconut is golden brown and the top is set. 6. While the coconut is baking, make the glaze. In a small mixing bowl whisk together the melted butter, confectioners sugar and lemon juice so that is completely smooth. 7. When the squares have finished baking remove them from the oven and drizzle them evenly with the glaze. The glaze will sink into the squares - that is alright. 8. Allow squares to cool for 1 hour on a wire rack. Then cover them with plastic wrap and refrigerate for 2 hours until they are set. Cut into 2" squares and serve. Naptime Recipe Ideas: These are a fantastic summer dessert for selling at a bake sale, serving at a picnic, on a buffet or taking to a new parent. They last for a few days stored in a sealed container and are a nice change from the regular lemon square. Naptime Stopwatch: Preparing this batter takes about 15 minutes. Naptime Reviews: My family loves all things lemon, so these were a hit. Also, the Moms at the picnic loved them as well. 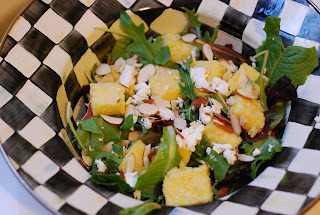 Spinach Salad with Goat Cheese, Almonds and Polenta "Croutons"
What's Going on Today: Packing, errands, general chaos. Pick up birthday present for 3 year old's birthday party this afternoon! Naptime Goals: No time for Naptime Chef-ing today - instead I'll use up some yummy leftovers in a salad tonight. Parenting Lesson of the Day: When in doubt, bribe. We are zeroing in on moving day and I am excited, but beyond stressed. It is craziness trying to pack a household, explain to a toddler what is happening and get everything set up at our new destination. We have had all the phone lines turned on and been given a new number by the phone company. But I still haven't bought phones. Based on this state of preparedness I'd say we'll be comfortably settled in our new spot by December. With all of the packing going on here today I haven't had time to Naptime Chef. My kitchen isn't being totally boxed up until next week - I'll be posting new food later this week and next week - but today I spent naptime wrapping picture frames instead of cooking. (Which, as you all know, I would have preferred to have been doing since I consider whisking much more fun then wrapping breakables.) So, like all resourceful home cooks in these situations, I turned to my stash of leftovers to see what could be combined with a few pantry items to make a yummy, nourishing dinner. Luckily, upon opening the fridge I discovered some of my leftover polenta bars and lots of fresh spinach. With these two items a hearty dinner salad seemed like the perfect idea: spinach salad topped with polenta croutons (my polenta bars cut into small squares), crumbled goat cheese and toasted sliced almonds from the pantry. If I had time I would also cook up a chicken breast for added protein, but, in this case, the polenta croutons will suffice. For a thrown together salad, I have to say, this one is pretty incredible. When topped with a light lemon vinaigrette it has a delicious tang to complement the goat cheese along with the oniony polenta croutons and crunchy almonds. After a long hot afternoon of packing this cool salad really hit the spot, it was both hearty and satisfying. While I ate it I was a little sad that I hadn't gotten to cooking during naptime, a source of great relaxation for me, but was pleased with our dinner. I think all parent's will agree, sometimes we all have these days where there is too much to do and not enough time. But, at least with a little ingenuity we can always cap it off with a good dinner, no matter the circumstances. 1. Combine the spinach, polenta, almonds and goat cheese in a large bowl. 2. Make the dressing by whisking together the olive oil, lemon, salt and pepper in a small bowl. Toss with the salad and serve immediately. 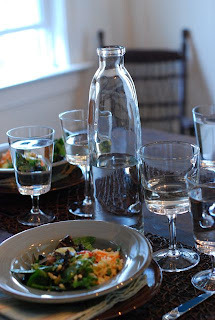 Recipe Variations and Ideas: Cold hearty salads are a great meal in the warmer months on days when you are too busy to Naptime Chef or it is too hot to cook. I find the basic formula for a great salad is a crumbled cheese, dark or mixed lettuce, nuts for crunch and a tangy bite like a dried fruit or flavored crouton. 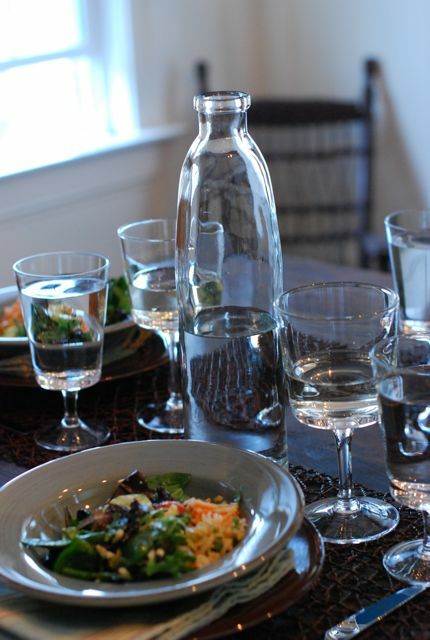 I prefer lighter viniagrettes for my salad, anything too heavy overshadows the flavors in the salad. Naptime Stopwatch: Making this salad takes about 12 minutes, if the polenta is already leftover or you buy precooked. It will take longer if you make the polenta from scratch. Naptime Reviews: My daughter is not big on salad yet, but she loved her second helping of polenta. What at honor it was to be voted one of the Top 50 Mom Food Bloggers by Babble Magazine this week! I am in terrific company with loads of amazing women and am thrilled that Babble considered me to be part of this unique group. Even better, I was given the honor of being consider #6 Most Fun to Read, a commendation I do not take lightly. You guys are the best! Lots of people are going online to vote for their favorite blogger and if you would like to vote for me I would be thrilled. Just go to this page and click the Thumbs Up "I like this" icon. This is a fun way to people to readers to give props to their favorite blogs. What Going on Today: Up waaaaayy too early this morning! Have to start packing boxes. We officially move in 2 weeks. Sad. 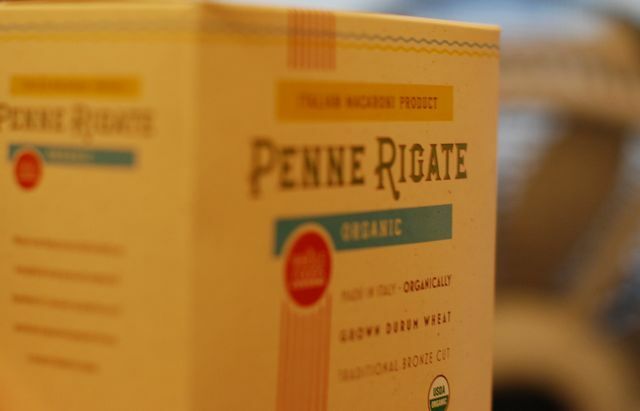 Naptime Goals: Make Polenta steaks using my new favorite recipe. Work on address changes, squeeze in a little R&R for me, too. Tonight's Menu: Chive Polenta Steaks, green salad. Parenting Lesson of the Day: It's easy to sell kids on a move with the promise of summer on the beach. I only have a few more webisodes left in this kitchen before I move to a bigger, more gracious space. Unfortunately, in order to get to this space, it means moving out of Manhattan and up to the Connecticut coast. We are only moving a few miles really, but it feels like much longer than that. I'll be sad to leave NYC, though I know it is time for open skies and grassy lawns. My daughter will love it and I'm sure we'll come around, too. But, never fear New Yorkers, I'll be back a lot. This will always be my daughter's hometown and will always be especially close to my heart, as well. Anyway, in the mean time I'm going to make the best of my current kitchen. I find it spacious and lovely, but it is pretty small and dark compared to what I'll be moving into. I will always be able to say this is where The Naptime Chef all started. Maybe someday the management company will hang a plaque on the wall or even disassemble the whole thing and move it to the Smithsonian. Or not. Either way, this place perfect for making polenta steaks. It's only recently that I've gotten into making polenta steaks. Until a few months ago I liked to make polenta creamy and loose, like a dense porridge. Then, I stumbled across Ina Garten's Polenta Steak recipe and gave it a shot. I was intrigued by the idea of polenta being a thick bar and cooked like a breast of chicken. Not surprisingly - like everything Ina makes - the flavors were delicious and the texture was perfect. Once I realized the brilliance of polenta steaks my wheels started turning. Why not, I thought, use this method and make new polenta steak flavors we all will enjoy. Since then I've been tinkering with it a bit, adding new flavors and adapting it so that it is perfect for making during naptime. As you'll see here, the great news is that I've succeeded in doing so. To prepare these steaks I add a little bit of extra cheese and some freshly snipped chives. I love the way this gives them a savory, almost oniony taste. Even better, all the stirring and adding things can be done while my daughter naps. Then the steaks only need to be cut and cooked - steps that take a few minutes - once dinner hour comes around. Enjoy! 1. Place butter and olive oil in a saucepan over medium heat. Allow butter to melt fully and stir in the olive oil. Add the garlic and chives and stir for 2 minutes. 2. Add chicken stock, milk and half-n-half. Slowly bring to a boil over medium heat. Once mixture is boiling sprinkle in 2 c. of polenta, whisking constantly to make sure no clumps form. Then, switch to a wooden spoon and stir until mixture is thickened like the dense porridge. About 8-10 minutes. 3. Remove the mixture from the heat and stir in the cheese. Then, pour it into a 13x9x2 baking dish, spreading it smoothly with the back of a wooden spoon. 4. Cover with plastic wrap and place in the fridge for at least 2 hours to cool and harden. It can be stored this way for up to 48 hours. 5. To prepare for dinner, melt a dash of butter and olive oil in a skillet. Meanwhile, cut the polenta into squares and dust lightly with flour. Then, add it to the hot pan and cook for about 4 minutes per side, or until each side is light brown and crispy. Serve hot. Naptime Recipe Ideas and Variations: If you want to add a different herb I recommend substituting rosemary or fresh basil for the chives. Don't like cheddar? No problem, just leave it out and add Parmesan instead. Naptime Stopwatch: Stirring the polenta and pouring it into the pan takes about 35 minutes. Allow it to cool in the pan for at least 2 hours. Cooking them takes about 10 minutes and, voila, dinner is served! Naptime Reviews: My daughter is slowly coming around to polenta, although she prefers the creamier version. These steaks are great when cut into shapes with cookie cutters, too. What's Going on Today: Finish nursery school registration for next year - yippee! Grocery store to pick up more cocoa powder. Naptime Goals: Make carrot souffle and a batch of Double-Chocolate Espresso Cookie Dough. Tonight's Menu: Grilled Chicken Sausage, Green Salad, Carrot Souffle. Cookies to be baked after bedtime. Parenting Lesson of the Day: It's amazing the treasures you find at the bottom of a suitcase! Yesterday I finally finished unpacking from our trip to Charleston earlier this month. It's almost inexcusable that it took me so long to get reorganized, but we've been really busy since we returned and I just didn't have time, or the energy, to tackle the suitcases. As I organized my closets I began reminiscing about everything I wanted to share with you. There is lots to tell, we ate at all sorts of wonderful places like Basil, Cupcake and Brixx - but, above all, the truly best meal I had in Charleston was cooked at the home of my friend's Stuart and Jenny. That's the one you all really should know about. My friend Jenny of the Super Veggie Tomato Sauce is a great home cook and this meal lived right up to her reputation. The good news is that although her son no longer naps, he now attends preschool allowing her some free time to enjoy cooking each day. (Incidentally, this will be the scenario in my household next year, too.) So, during her free time one Tuesday while, her cutie pie (who wants to date my daughter) was off learning his A, B, C's and Jenny was in the kitchen wrapping salmon in foil packets, marinating potatoes and baking one heck of a delicious blueberry crisp. I swear, her last name isn't Stewart. But it could be. When we arrived at their house that evening the kids went crazy playing with all of the toys and the adults settled in with a glass of wine to catch up. Jenny, having already coordinated the meal earlier that day, was able to relax with us. Stuart was in charge of the salmon on the grill - not a tough assignment - the potatoes and asparagus went into the oven to roast and the dessert had already been baked. Even more amazingly, her table was set simply and beautifully, check it out below. The whole meal was perfectly balanced and delicious from start to finish. Ever the consummate hostess she kindly shared the source of her recipes with me so that I could, in turn, pass on her ideas to you. 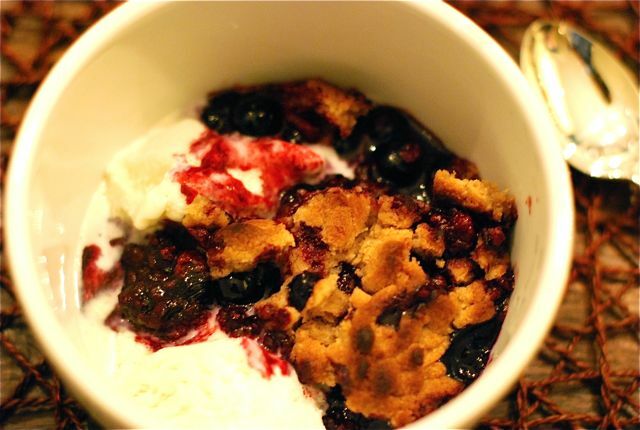 They are all worthy of attention, especially the blueberry crisp. It was filled with rich fruit, topped with soft crumbly crust and it melded perfectly with the small scoop of vanilla ice-cream in our bowls. I can't wait for blueberry season to start here because this is first on my list to make. Thanks Stuart and Jenny for a great meal! 1. Preheat oven to 350 degrees. Butter a 2-quart shallow baking dish and set aside. 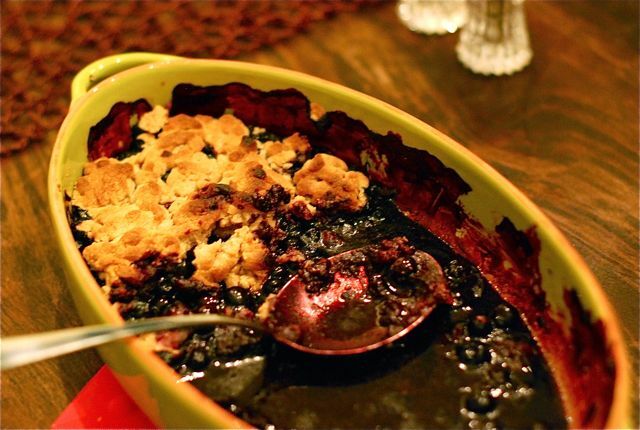 In a medium bowl, toss blueberries with 1/2 cup flour, the granulated sugar, and lemon juice. Spread evenly in prepared baking dish, pressing down lightly. 2. In a small bowl, mix together brown sugar and the remaining 1/2 cup flour; add butter. 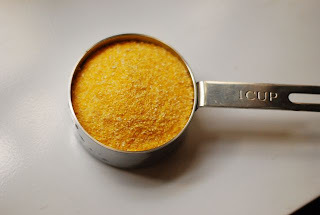 Using your fingertips or a pastry blender, mix the butter into the dry ingredients until it looks like coarse irregular crumbs. 3. Spread crumbs over blueberries. Bake for 10 minutes. Reduce the oven temperature to 325 degrees. and bake until the crumbs are browned and the juices have thickened, about one hour. Serve warm with a big scoop of vanilla ice-cream. Naptime Recipe Variations and Ideas: I have to play with this recipe a tad, but I bet it would be delicious with rhubarb, or even blackberries. Naptime Stopwatch: Jenny says this took her about 20 minutes to assemble, plus baking time. Naptime Reviews: This is a great dessert for both adults and children. We loved the fruity flavor and my daughter will devour anything with ice-cream in it! What's Going on Today: Crazy Friday - daughter's pre-school class, lunch date, after naptime coffee with friends. Naptime Goals: Catch up on correspondence, order more summer clothes for daughter, prepare for the weekend. Make artichoke heart sauce. Tonight's Menu: Tessa's Penne with Artichoke Hearts, slice of Banana Bread for dessert. Parenting Lesson of the Day: TGIF. It applies to all of us. This week has been wonderful - daffodils are springing up everything, masses of birds flit around the parks and we can't get enough of the playground and parks. Funny though, with all this natural beauty to call us outdoors I've noticed that the pace of life has quickened. Tenfold. All of a sudden it is Friday and I have no idea where the time has gone. No matter though, tonight I am going to pull out one of our old favorite, Tessa Kiros' Penne with Artichoke Hearts. You all know artichokes are one of my favorite vegetables and this is one of my favorite ways to cook with them. I love the way Tessa tosses them with pasta and a basic pan sauce. The flavors are simple, clean and satisfying. To prepare this during naptime I only have to do one thing - make the sauce. My favorite method for doing start out naptime by sauteing the artichokes then adding the broth so they can simmer away while I do other things. Sometimes I use fresh artichokes for this dish too, I just didn't happen to pick any up today so I am using the frozen ones from my freezer instead. This is one of those dishes that it is best not to over think. 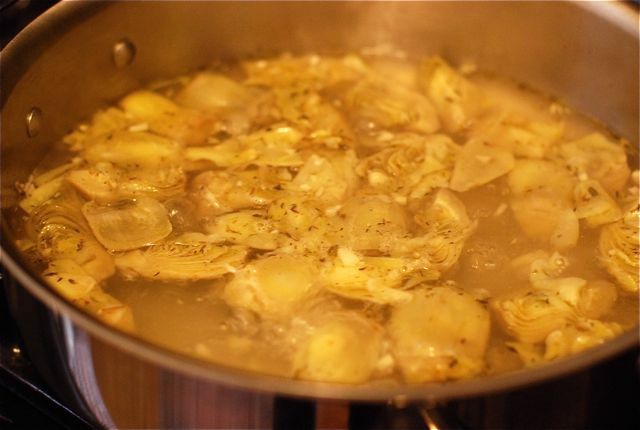 Simply prepare the artichokes as instructed and gently toss them with the pasta. 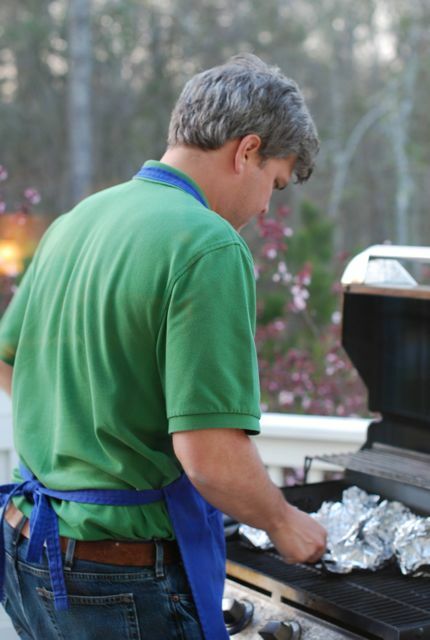 That's all it takes to serve a warm, spring meal for dinner after a long week out and about. This is one of my go-to spring dinners, especially when artichokes are in season and it is bound to become one of yours as well. 1. In a wide, shallow sauce pan heat the olive oil. Add the garlic, thyme and the artichoke hearts, saute until tender and a little golden on the edges. About 4 minutes. Then, add the broth and set it to simmer over low-medium heat until it is reduced to less than 1 c. of liquid. Before you turn off the heat taste it for seasonings and add a few pinches of salt and pepper as needed. 2. Boil the pasta in salted water according to package directions. Place it in a large bowl and toss it with the artichoke sauce. Sprinkle with parmesan and serve. Naptime Recipe Ideas: This recipe doubles well and would be great served at a luncheon or on a buffet. If you wanted some extra texture you could also consider adding some sliced almonds. Naptime Stopwatch: 5 minutes to prepare the sauce, 30 minutes for it to simmer. Naptime Reviews: My daughter is unsure about artichoke hearts but loved the smooth, creamy pasta. My husband adored this, especially after a long week at work. What's Going on Today: Up earlier, sun is brighter, playground more active - everything is better in springtime. Off to the farmer's market to pick up fresh veggies and all of my favorites from Ronnybrook Farm. 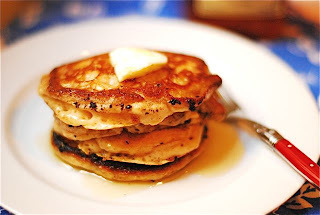 Naptime Goals: Make big batch of Pancake Mix for pancake breakfast on Saturday. Tonight's Menu: Leftover Browned Butter Asparagus Risotto. Leftover Easter candy dessert. Parenting Lesson of the Day: The bigger the stack of pancakes, the happier the kid. Tonight there are delicious leftovers in the fridge for dinner so this afternoon I am going to use naptime to stock up on my pantry basics. There many times I do this throughout the year like when I make large batches of pesto, Apricot Jam, Meatballs or Tomato Sauce. It makes so much sense to make these delicious basics in bulk, that way I can always have them on hand instead of making them from scratch every time I need them. Furthermore, I enjoy making them, I am always excited to set aside a naptime or two each month to replenish my supplies. Today I am making a fresh batch of homemade pancake mix. I know that there are a lot of Bisquick devotees out there, but I am not one of them. I prefer this homemade version to anything store-bought - plus it is much less expensive. I got the idea to add malt powder from my brother, the infamous Uncle Will. He spent a summer working in the kitchen at the Otesaga Hotel and had a chance to tap the Chef for many of his secrets. The key, he told Will, to delicious Belgian waffles and sweet pancakes is malt powder. We took his word for it, tried it in our parent's kitchen and, wouldn't you know it, Chef was right! 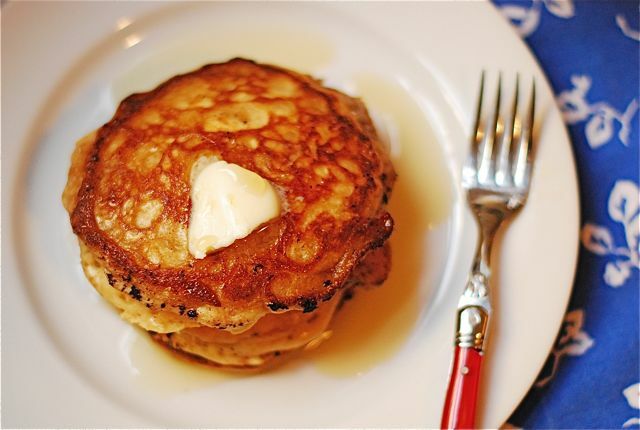 The malt powder gives the pancakes a nice texture and slightly sweetened flavor, erasing any trace of flour or baking soda on the palate. These days I make my pancake mix in a big batch and keep it in a glass jar with a scoop. This way we have it on hand anytime we need it. Some weekdays, when I have slept especially well, I do a pancake breakfast with my daughter. But, admittedly, I mostly do them on the weekends. The beauty of this pancake mix is that it keeps for several weeks so you can easily whip up a stack anytime you want. I often take the traditional route when serving pancakes, opting for real butter and delicious homemade maple syrup. But, when I want to change it up I add a dash of almond extract and some lemon zest to the batter to give it lemon almond flavor. Recently I even topped a stack with creamy homemade ricotta and some fresh berries - it was delicious! Any way you like to eat them is fine with me, just make sure the maple syrup is real - not imitation. Also, I think pancakes are best eaten when everyone is still in their jammies. 1. Mix all ingredients in a big bowl with a whisk. Store in an airtight container until ready to use. 1. On a skillet or wide, shallow sauce pan heat the butter over medium heat and swirl so that it covers the bottom of the pan. 2. Ladle the 1/3 c. of the batter into the pan and let it warm until bubble starts to show on the surface. Flip quickly with a thin spatula and allow to cook on the other side until golden brown. Serve hot. Naptime Recipe Ideas and Variations: The key to this recipe is a malt powder. If you don't add it your mix may seem a little bland and basic. But, no matter how you make it, be sure to have fun dressing up the pancakes once their made. My favorite toppings are sliced fruits, maple syrup, fruit syrup and sweet cheeses like ricotta or mascarpone. Naptime Stopwatch: Make the pancake mix takes all of 5 minutes! Making the batter and enjoying the pancakes takes about another 10 minutes. Naptime Reviews: My daughter adores pancakes, especially when they are cut up in little triangles that she can dip into a ramekin of warm syrup! My husband likes these too, often served with a side of bacon. What Going on Today: Spring fever! Outside all morning, quick stop for tomatoes and organic rotisserie chicken before heading home for naptime. Naptime Goals: Make Tamra Davis' Ranchero Sauce and prepare Chicken Enchiladas for dinner. Make fresh batch of Mimi's Tex-Mex Guacamole. Tonight's Menu: Chicken Enchiladas with Ranchero Sauce, Mimi's Tex-Mex Gaucamole, Spanish Rice, White Wine. Parenting Lesson of the Day: I don't know who is more excited about spring, me or my daughter! What is it about the warm weather that makes me want to run for the border? No, not the gross fast-food border, the yummy Tex-Mex border. I didn't grow up eating a lot of Mexican food, we only ate it when we traveled to Mexico City to visit my cousins. I really developed a taste for it when I moved to New York. There aren't a ton of great Mexican food places here, but enough to satisfy my curiosity and excite my palate. I've recently become obsessed with the Tamra Davis Cooking Show and her cookbook, Make Me Something Good to Eat. Tamra really knows her stuff and is even becoming our stateside Jamie Oliver with her great initiative, Five For Kids, teaching cooking and healthy eating habits in NYC's public schools. Since Tamra is from L.A. she knows her Mexican food backwards and forwards and, I am thrilled to say, devotes an entire chapter to it in her cookbook. With the arrival of spring I've been craving lighter, spicier food. Over the past two weeks I've tucked away all of my heavy soup and casserole recipes, opting to cook with light, fresh spring flavors. And Mexican food, the way I make it, is exactly that. I don't laden it down with heavy oily cheese and sour cream, instead I use fresh corn tortillas, light, spicy tomato sauce and fresh seasonings. When I made this yesterday my daughter and I stopped at Las Palomas, the awesome Mexican grocery store in my neighborhood, to pick up chilis and tortillas. (I could have bought the whole store that place is so great.) It's not quite tomato season yet, but I was still able to find some beauties at my local grocery store which were perfect for the sauce. Then, to save myself time, I picked up an organic rotisserie chicken at Whole Foods to shred for the enchilada filling. 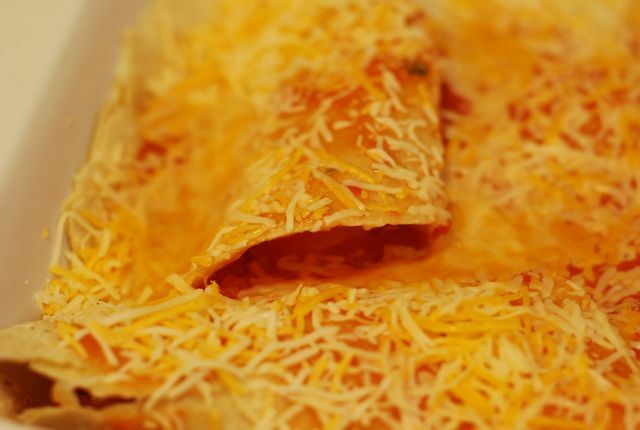 Enchiladas are a great dish to prepare during naptime. Yesterday I simply made the sauce, shredded the chicken and prepared a casserole dish full of the assembled tortillas. Then I left it, covered in the fridge, until I was ready to bake it later that evening. I also decided to change up our green portion of the meal and whipped up a naptime batch of Mimi's Tex-Mex Guacamole, my first of the season. 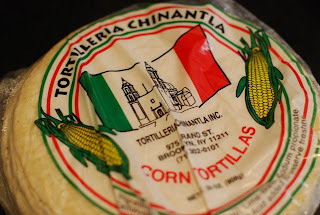 It is great for dipping the enchiladas in, I prefer it over sour cream. When dinner time came around I baked the enchiladas, prepared the rice and our meal was served. It was a great Mexican feast that everyone was able to enjoy. My daughter opted out of the guacamole but was game for the basic chicken enchilada. My husband devoured his plate, as I did mine. The meal was a delicious and Tamra's sauce recipe is a real treasure. Fresh, spicy and light, it really made the enchiladas tastier then ever before - the perfect meal for any foodie family. We especially liked that we were able to eat our meal while the sun was still out and the birds chirping at 6:30pm. Spring really has arrived. 1. In a large 4 quart sauce pan bring 4 cups of water to a boil. Add the tomatoes and the garlic and cook for 20 minutes. Meanwhile, in a separate skillet heat 1 t. of olive oil and saute the onions until soft. 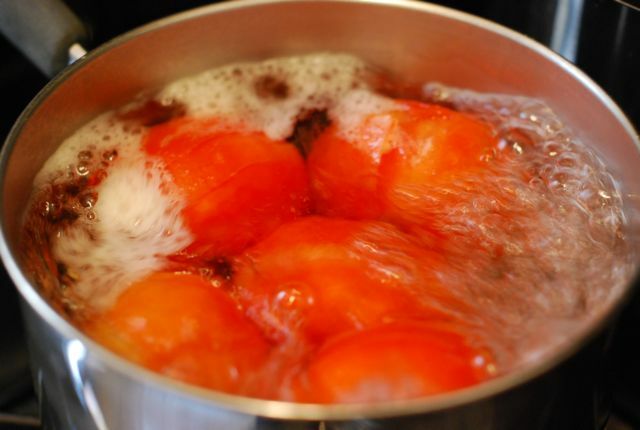 In the boiling water the tomato skins should start to peel off on their own. After 20 minutes remove the tomatoes and strip them of their skins. 2. Place the peeled tomatoes, garlic cloves, softened onions, chilies, salt, vegetable stock and oregano in a blender with about 1/2 c. of the cooking water. Blend well. Taste it with a spoon and add more salt or chilies as needed. 3. Pour sauce back into the sauce pan and cook for another 15-20 minutes on a low simmer, it will thicken up slightly and can be used right away, or stored for up to 3 days in the fridge in a sealed container. 1. Preheat the oven to 350ºF. Brush the bottom of a 9x13 baking dish lightly with olive oil. 2. Carve the rotisserie chicken and shred the meat with the tines of a fork until the strips are small enough to be wrapped in a tortilla. 3. Lay a tortilla on the counter, place a small pile of meat on it, then drizzle with a Tablespoon of Ranchero sauce and sprinkle with cheese. Roll up the tortilla and place it, opening side down, in the baking dish. Repeat until baking dish is totally full. This usually makes about 14 enchiladas when I make it. 4. Pour 1 1/2 c. of Ranchero Sauce over the enchiladas and sprinkle with remaining shredded cheese. If making ahead, at this point the enchiladas can be covered with plastic and placed in the fridge until dinner time. 5. Bake at 350ºF for 35 minutes, or until top is bubbly. Serve hot. Naptime Recipe Variations and Idea: I like to make our enchiladas with chicken, but you could also make them with shredded beef if preferred. They would also be good stuffed with more vegetables like peppers or spanish rice. I usually serve rice on the side. Naptime Stopwatch: Preparing the sauces takes about 20 minutes. Preparing the enchiladas takes about 20 minutes. Baking time is 45 minutes. Naptime Reviews: Enchiladas are a great meal for both adults and children, these got rave reviews all around. Any leftover cheese and tortillas can be used to make quesadillas the next day for lunch. What's Going on Today: Visiting a friend in upstate New York, major arts and crafts projects with kids! Naptime Goals: Relaxing with good friends while the kids nap, making cookie dough to prepare for decorating Linzer cookies. Tonight's Menu: Baked Chicken, Creamy Polenta, Carrot Souffle, Easter Linzer cookies. Parenting Lesson of the Day: Sleepovers are so much fun, no matter how old you get! This year we won't have a big Easter celebration since we'll just have returned from traveling, but that hasn't deterred us from undertaking a few holiday related projects this month. When we were visiting our friends in upstate New York last week the other Mom and I decided it would be fun to bake some cookies with the girls. Ever the fans of baking projects - any chance to eat cookie dough (!) - the girls completely agreed. Since they both still nap in the afternoon it was easy for us to set up the project. We simply prepared the dough in mid-afternoon and cut out the shapes with the cookie cutters. Then, we set out some fun sprinkles and let them go to town decorating when they woke up. You should have seen the mess on the kitchen floor! After the cookies had baked and cooled they finishing them by spreading the jam on - rather sloppily - and placing the cut-out cookie on top. To play up the Easter theme we used a mini bunny cookie cutter instead of the usual smaller circle. It was a cute way to give our favorite jam cookies a holiday twist. Needless to say, holding the girls back from eating more than one before dinner was quite tough. However, in typical kid fashion, the cookies were the perfect incentive to get them to clean their plates! Best wishes to everyone for a fun, family holiday this weekend! 1. Preheat oven to 350ºF. Line two baking sheets with parchment paper or Silpat. 2. Sift together flour and salt in a bowl and set aside. 3. In a mix cream the butter and sugar until totally combined. Then, add the vanilla and lemon zest, mix again. With the mixer on low, add in the flour/salt mixture until the dough comes together. Do not overbeat. Wrap in plastic and chill for 30 minutes. 4. Place the dough on a floured surface and roll out until 1/4 inch thick. Cut out rounds in a 3 inch round cookie cutter. With 1/2 of the rounds, cut out a smaller shape - like an easter bunny or similar. Use extra dough to form a few more cookies. Place all cookies on the cookies sheets and bake for 20-25 minutes. 5. Allow cookies to cool to room temperature. 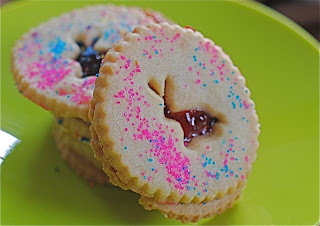 Then, spread raspberry preserves on the bottom cookie and place the cut-out cookie on top. Dust the top of cookies with confectioners' sugar. 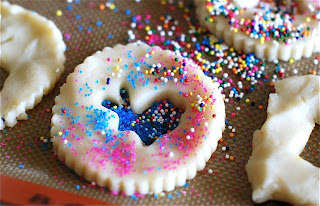 Naptime Recipe Ideas: Instead of confectioners' sugar the kids love decorating with sprinkles, feel free to do the same. Also, instead of lemon zest you could use orange zest, and feel free to use another flavored jam if you prefer. 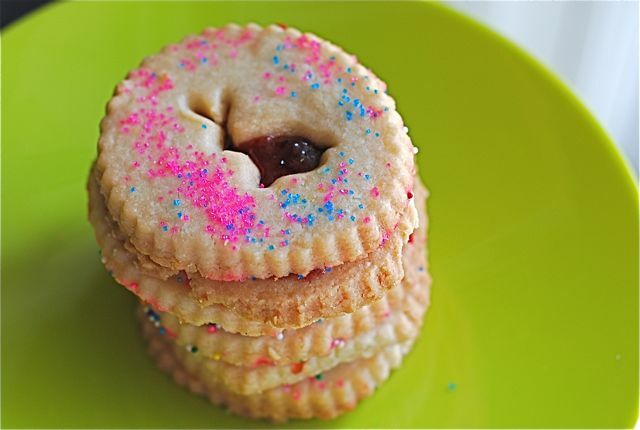 Naptime Reviews: Jam sandwich cookies are fantastic for families or serving at more formal teas. I think I might try my homemade Apricot Jam in these this summer.